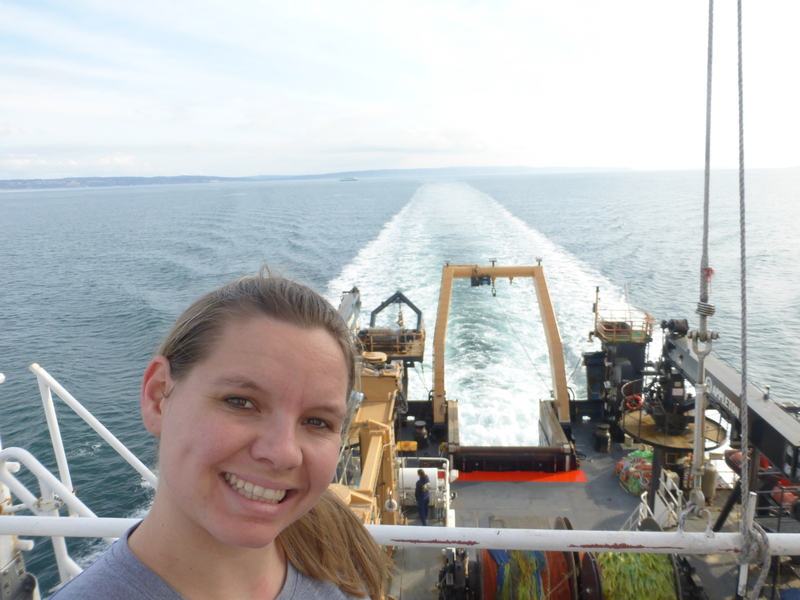 TAS Sian Proctor admiring the view on board Oscar Dyson in Alaska. 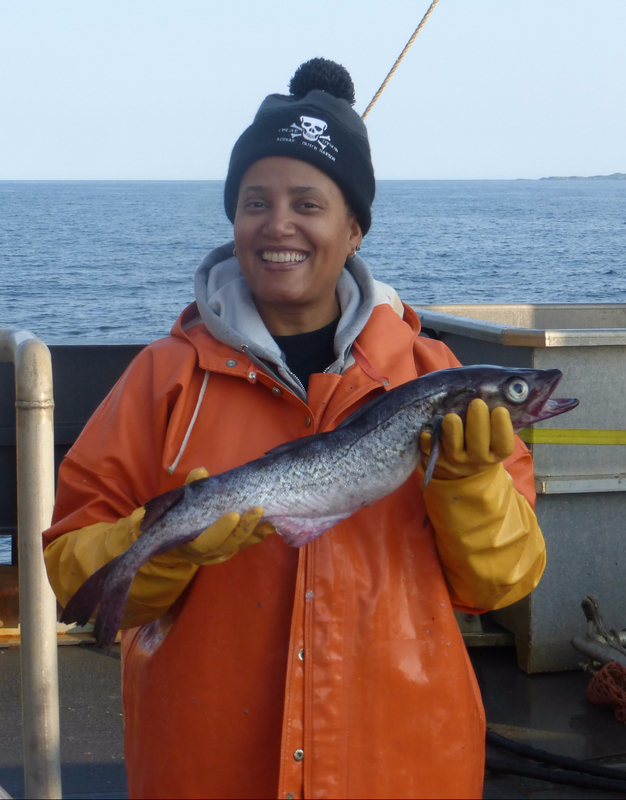 We are off and running in our quest to track Alaskan pollock. The first thing I realized was the complexity of fishing operations. There are so many parts to a successful operation and one of my favorite components is all the maps and navigation. Once the ship is navigated to the first transect line then the scientific research begins. A down-looking echo sounder system located in the centerboard of the ship has five transducers (18, 38, 70, 120 and 200 kHz) that emit short pulses of sound. This means that energy, in the form of sound waves, is being sent out from the bottom of the ship. When sound waves encounter a change in sound speed, density, or a combination of both, some of the energy is scattered (reflected) back to the ship. The amount of sound scattered by an object in the water column is a function of its physical characteristics and the frequency of the sound. In animals, important physical characteristics that affect the amount of scattering include the presence of a swim bladder (a bubble! ), bone structure, and size. Various animal types with different morphological characteristic will scatter different amounts of sound as a function of frequency, which scientists can use to aid their interpretation of the observations. 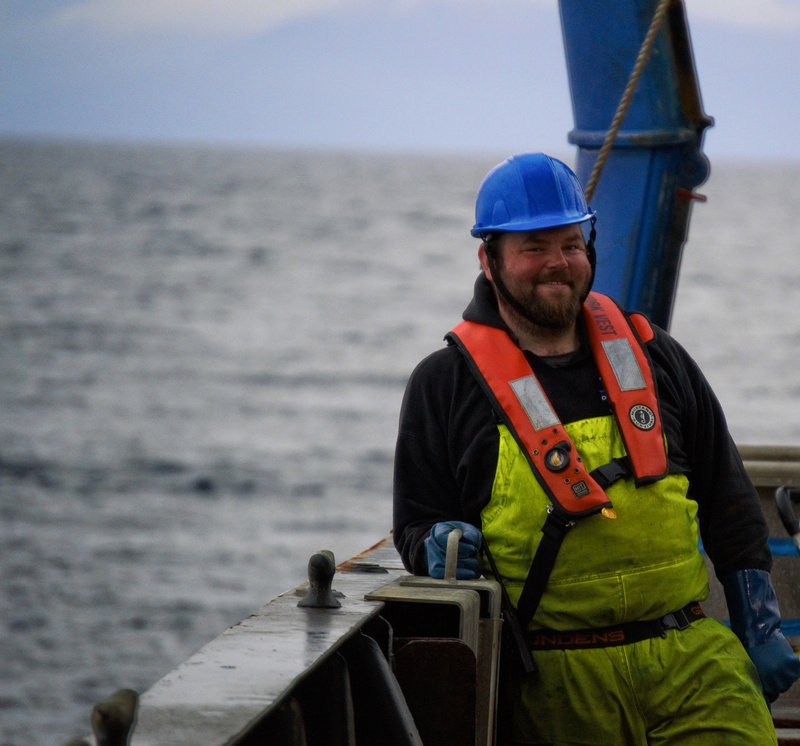 The NOAA scientists know, through research, that krill scatter much more energy at 120 kHz and 200 kHz than at 18 kHz, but pollock scatter similar amounts of energy at all of the frequencies used in the survey. Ultimately, the five frequencies are used to support decisions about the types of animals that are scattering the sound in the water column, but the scientist use only the 38 kHz transducer data to derive estimates of fish abundance. NOAA Chief Scientist Taina Honkalehto analyzing an echogram. The echogram is color coded to represent the density of biomass within the water column. Red are areas of high concentrations of biomass and blue are areas of low concentrations. The bottom of the ocean floor shows the rainbow of colors. The NOAA scientists note GPS coordinates spot to fish based on the echogram. All of the scatter produced by the pollock, and other animals in the water column, is processed by the ship’s computers to produce an echogram. Each column in the echogram is a view of the spatial distribution of animals under the ship at that time. By moving around the survey area and “stacking” many observations a spatial view of the biomass distribution is created. NOAA scientists in the acoustics lab analyze the echogram not only to determine what is in the water column, but also where to perform physical samples (trawls). The ship then navigates to that location and the sampling process begins. Before starting my Teacher at Sea adventure I had no idea that there was a career called ocean acoustics engineer. 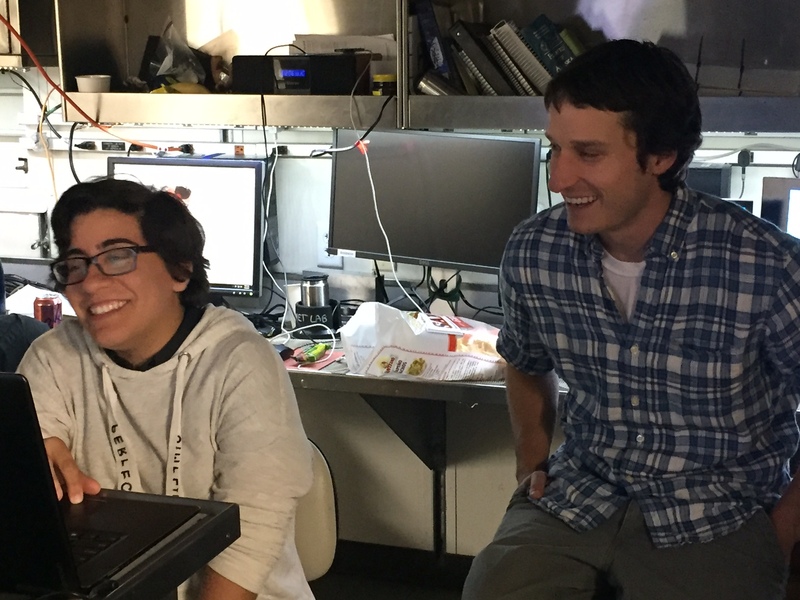 Everyday I have been interacting with NOAA Acoustics Engineer Chris Bassett and University of New Hampshire graduate student Alexandra Padilla to find out why they chose this career. One thing I notice is that they build really cool instruments and they are teaching me a lot about how we study the ocean using sound. NOAA Ocean Acoustics Engineer Chris Bassett schooling me on sound. I study the use of passive and active acoustics in marine environments. A combination of management of ET/IT support for survey operations and special research projects at night. This is my third field season. My first cruise was the summer of 2015. When I started graduate school I wanted to transition to working as an engineer in renewable energy. The economic conditions in 2008 resulted in the loss of funding for the project I was planning to work on. Instead I agreed to perform a short study on underwater sound in support of a tidal energy project in Puget Sound, WA. I fell in love with the work and have been studying acoustical oceanography ever since. Going to sea in Alaska. It’s beautiful. Not until I started doing ocean research. Prior to that the idea had never occurred to me. I didn’t see an ocean for the first time until I was in my teens so the idea of working in ocean science was completely foreign. I did, however, know I was interested in science and engineering from a relatively early age. 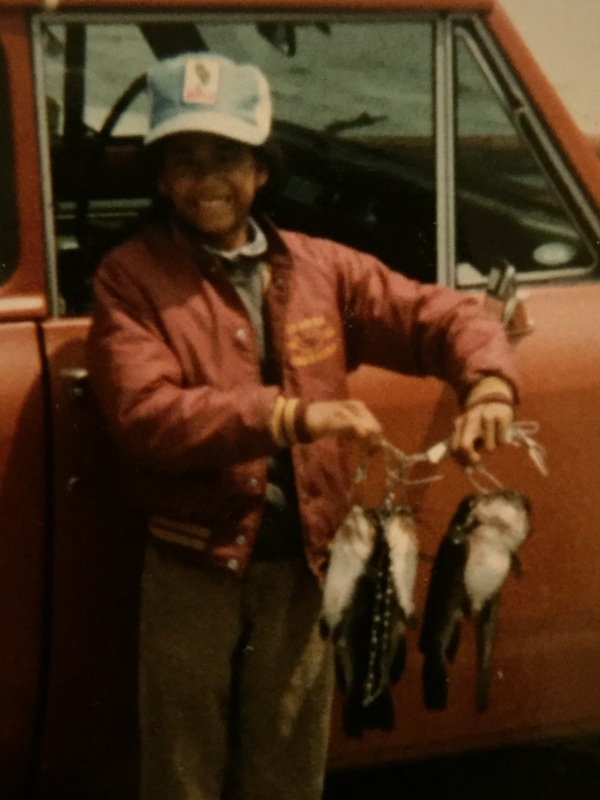 Nonetheless, pursuing a career in science never occurred to me until I first worked in the field and discovered my passion for the subject. Chris Bassett at work on Oscar Dyson. Working with data sets (biological or physical) obtained in the field. Working with data obtained at sea from uncooperative sources is not easy. My job also requires a variety of skills (e.g., engineering, math, coding), a willingness to learn about biology, and requires a lot of travel. Expanding my knowledge across these fields is a constant challenge. I learn something interesting every day. Sunset at the Islands of Four Mountains while one of the volcanoes was smoking. Little more can be said. It was a beautiful day! 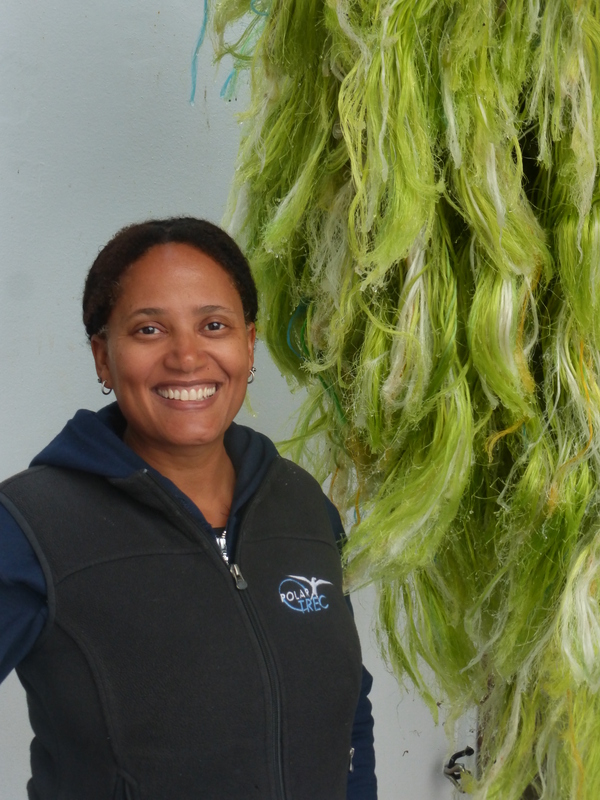 Ocean Engineering PhD Student – and Sian Proctor’s awesome roommate aboard Oscar Dyson. I am a PhD graduate student. I usually spend my time split between courses and research. I am about to start my third year at University of New Hampshire and I will be focused mostly on taking classes, passing my qualifiers, and doing research. I am an invited scientist. This is my first time aboard the Oscar Dyson! Actually, it is the first time I have ever been on a scientific cruise. Oh Boy… That is a long story actually. Life. Alex Padilla and Chris Bassett working on an acoustic research project aboard Oscar Dyson. 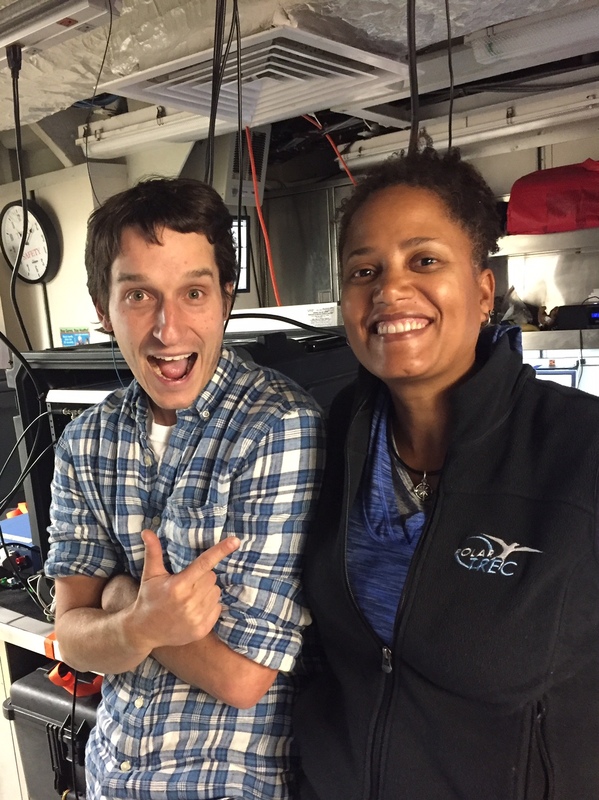 My favorite thing about going to sea is learning from all of the other people that are on Oscar Dyson – from NOAA Corps officers, crew member and fellow scientist. 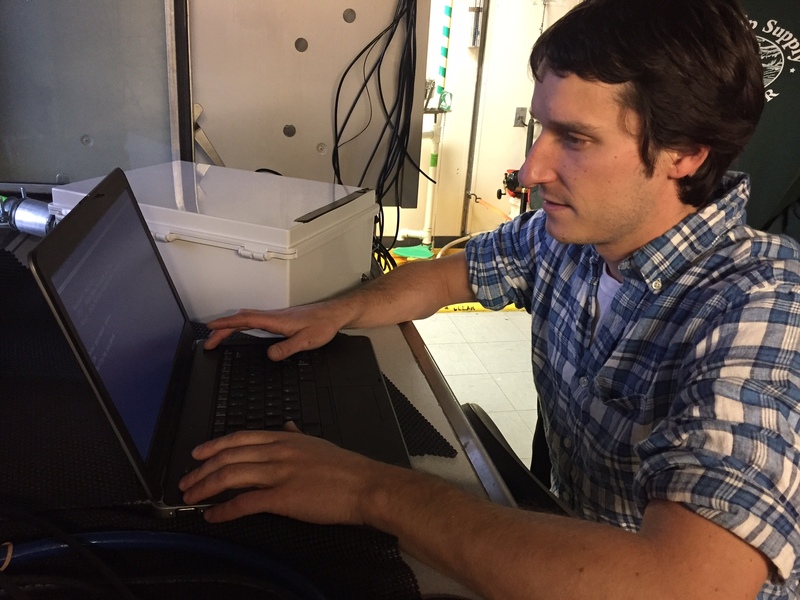 My research is focused on observing methane seeps in the water column and quantifying the flux of methane within the water column and at the air-sea interface. This research is important for understanding how methane release in the ocean contributes to climate change. I knew I wanted to be an engineer since elementary school, but I only realized that I wanted to be an ocean engineer during my third year as an undergrad. Things don’t always work out the way you want them to and sometimes you don’t know how to fix them. Doing unique research. Also, getting that sense of satisfaction when you fix that one problem that you thought you couldn’t do. I have yet to have a specific memorable moment at sea but I do have a memorable feeling every time I look at the horizon when on the ship. It feels like freedom. I was pleasantly surprised by how much I am enjoying being at sea. I think a big reason why is the smooth ride. The sea has been calm, the weather mild, and the sunshine plentiful. The scenery within the Shelikof Strait, particularly along Katmai National Park, has been stunningly beautiful. A perk of the early morning shift is seeing the sunrise. Take a look at the weather report above for the sunrise and sunset times. You’ll notice that the amount of darkness is minimal this time of year. Sunrise in Alaska aboard Oscar Dyson. The hardest part of the journey so far has been my schedule. We work 12 hour days and my shift is 4 am to 4 pm. Yep, 4 am! I am not a morning person – but I am also not a late night person. So given the choice between getting up or going to bed at 4 am – I choose to wake up with the help of coffee – coffee – coffee. TAS Sian Proctor and NOAA Chief Scientist Taina Honkalehto. The NOAA crew are friendly, informative, and have made my adjustment to life at sea easy breezy. Every day I learn something new. The NOAA Chief Scientist is Taina Honkalehto. I was thrilled to learn that she’d be my mentor for the Teacher at Sea program because I am an advocate for women in science. I am also surrounded by other crew members, both men and women, who have taken time to teach, advise, and guide me every day. I will be trying to highlight as many of them as possible in my blog posts. One thing I am learning is that there are so many different careers dealing with ocean science. Here is a great resources If you have students who are interested in a career in ocean or marine sciences. There are so many things you can learn about sound and the sea. The Discovery of Sound in the Sea website is chuck full of information and educational resources. NOAA diagram of how sound travels in the ocean. Oscar Dyson is one of NOAA’s fisheries survey vessels. It was commissioned in 2005 and its home port is Kodiak, Alaska. The ship was named after the Alaskan fisherman Oscar Dyson who was an activist for improving the fishing industry. He passed away in 1995. 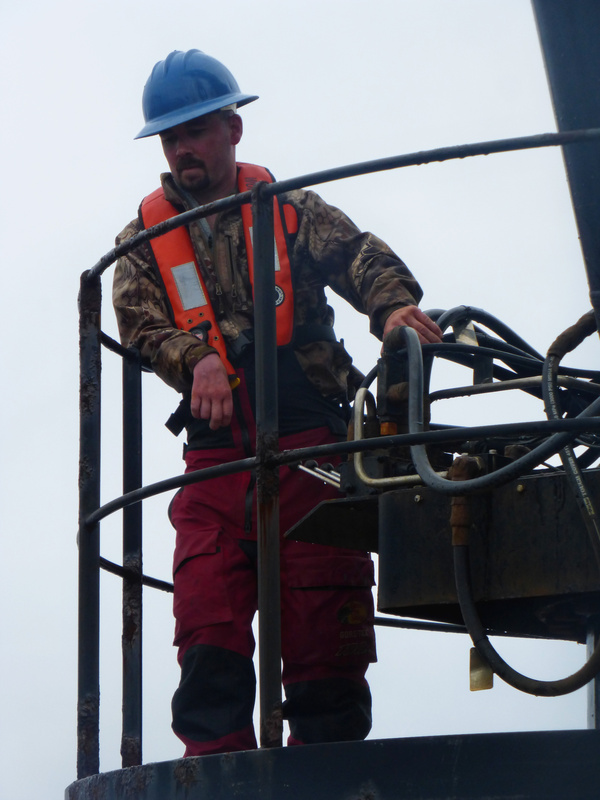 The purpose of Oscar Dyson is to collect data on marine life and ecosystems primarily in the Bering Sea and Gulf of Alaska. Most of the research has been focused on the management of Alaska pollock, which is the largest fishery by volume in the United States. The ship houses a crew of up to 24, which includes NOAA Corps officers, engineers, deck hands, survey technicians, stewards, and electronic technicians along with up to 15 scientists. They all work together to make daily operations on the Oscar Dyson a success. The 208 ft. long Oscar Dyson runs on 4 super charged diesel engines. The engines are designed to produce up to 3 megawatts of electricity a day. The alternating current is converted into direct current in order to power the two propulsion motors. Oscar Dyson’s engine room is fully automated and will add or remove diesel generators based on load demand. Oscar Dyson has a cruising speed of 12 knots and a range of 12,000 nautical miles. I was pleasantly surprised by how spacious my accommodations are on Oscar Dyson. I am in a 4-person room but have only 1 roommate. Her name is Alex Padilla. She is an ocean engineering graduate student from University of New Hampshire interested in studying the acoustics of bubbles. Our room has bunk beds on both sides of the room, a desk, multiple storage lockers, a toilet & shower, and a large wall mounted TV with movies and Direct TV. Just down the passageway from my stateroom is a crew lounge where we can gather and watch movies. There is a mess deck (cafeteria) that serves three meals a day and is open 24/7 for soup, salad, and snacks. Oscar Dyson has a variety of labs that I will cover in future blogs. I was fortunate to have 3 days on the ship before our departure and have become somewhat familiar with the layout of the ship. I got to go on a field trip to Fossil Beach before leaving Kodiak and here is a short video about my experience. Click this link for more information on concretions.